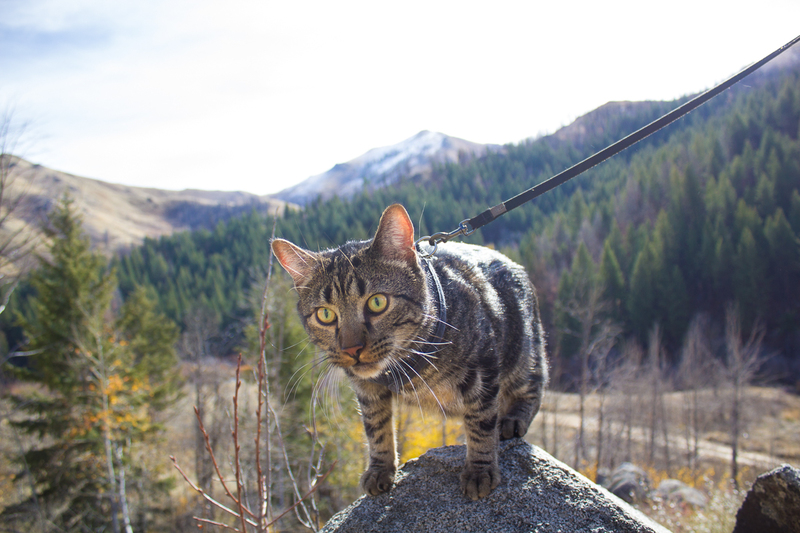 Bright-eyed and full of energy, Jasper the adventure cat was made for the Idaho wilderness. 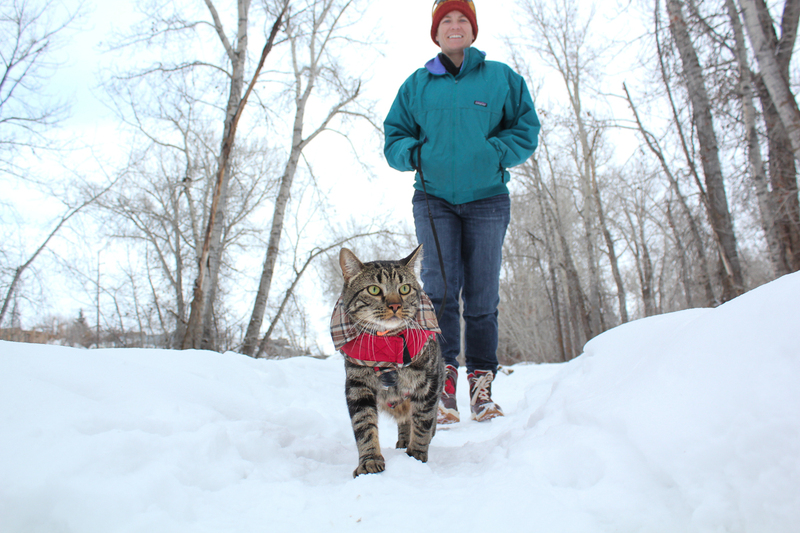 No matter the season, this cat loves to get out and about with his owners. 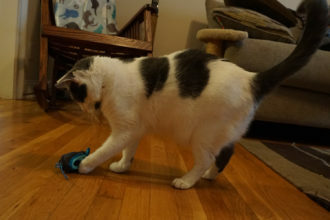 We chatted with Jasper’s humans, husband and wife Dave Keir and Gadrie Edmunds, to learn a little bit more about their “ameowzing” cat and his journeys into the great outdoors. 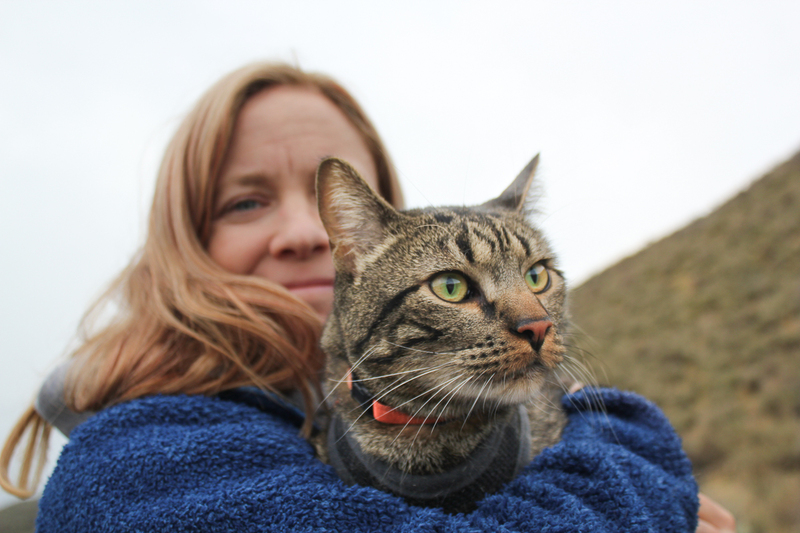 Adventure Cats: Tell us a little bit about yourself and Jasper. Gadrie Edmunds: We live in Hailey, Idaho, which is just 10 miles south of Sun Valley Ski Resort. This area offers a ton of outdoor recreation opportunities — we’re year-round runners, and we also enjoy Nordic skiing, a little bit of mountain biking, hiking, camping and fly fishing as the seasons permit. I’ve always been a cat lover and cat owner. In the spring of 2015, we had to say goodbye to our very sweet, easygoing 16-year- old male tabby due to lymphoma. By the fall of 2015, I was feeling like it might be time to adopt another kitty. Although we had an older female cat at the time, she liked to do her own thing and mostly enjoyed napping in the sun. I was really missing the company of the type of cat who would “help” around the house. Cat owners know the type I’m talking about. We made a trip to our local, no-kill shelter in late November (shout out to Animal Shelter of the Wood River Valley). They had maybe half a dozen kittens in one room, one of whom was Jasper (he was 3.5 months old at the time). Most of the kittens were doing their kitten thing — playing a bit or napping. Jasper was literally climbing the walls of the wire enclosure, and yelling his fuzzy little head off. When I went into the room, the other kittens were somewhat interested, but not too pushy. Jasper jumped off the wall onto a shelf and onto my shoulders. He was purring up a storm and still yelling occasionally and climbing all over me. Of course, he went home with us the next day. 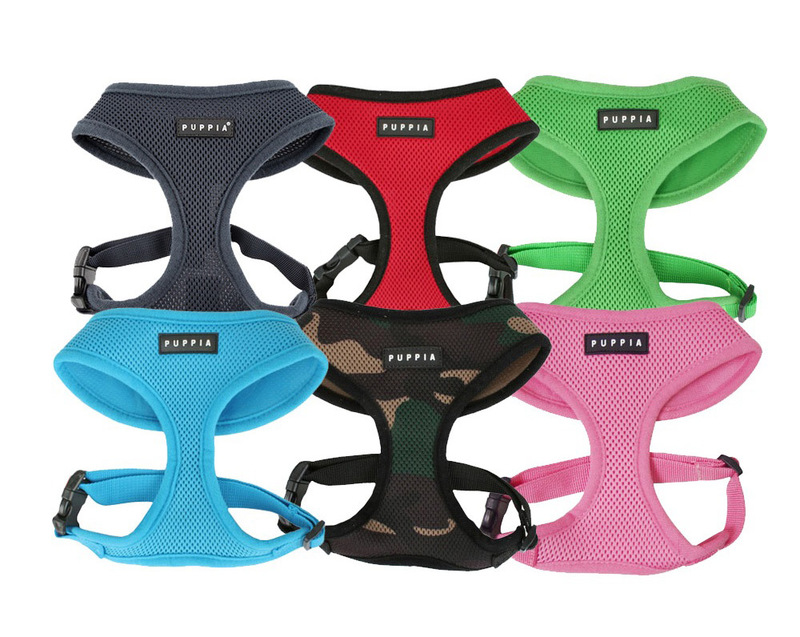 When and why did you decide to train Jasper to go outdoors? 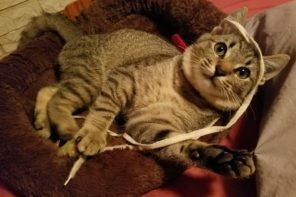 Here’s the thing: Jasper was clearly the most energetic kitten at the shelter, but I naively thought that he’d settle down a little bit when he got into a home and had more space to play and more interaction with people. I was so, so wrong. You know how most kittens will play really hard and then sleep really hard? Jasper just doesn’t have the same ‘off’’ button. Even when he looked like he was taking a solid nap, he could snap awake and be ready to rumble at the slightest noise or movement. He wanted to play at 2:30 in the morning, and he was insistent. He was really interested in vertical space, so he was climbing the shower curtain, blinds, and bookshelves, and trying to knock pictures off the walls. 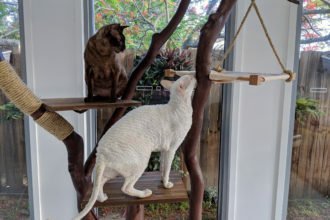 Yes, we had cat trees and even installed shelves for him, and it still wasn’t enough. I had put a little Christmas sweater on Jasper just for laughs and unlike a lot of cats, he really didn’t care at all, so I thought he’d take to a harness okay. We started off with him wearing the harness in the house, then the harness and leash, so he could get used to feeling some tension and restraint. From there, I took him into our fenced backyard. It was January when we started taking him outside, and there was snow on the ground, so at first he only wanted to stay on our shoveled deck. Eventually, his curiosity got the better of him and he wanted to check out more of the yard and garden. From there, I took him to a nearby elementary school where he could check out the fenced playground, and ultimately onto the trails! I kept those early leash sessions pretty short and made sure he got lots of positive reinforcement via tuna or other treats. Where are some of your favorite places to go hiking with Jasper? It’s hard to pick a favorite! There’s one local trailhead pretty much around the corner from our house, so that’s an easy go-to for weeknights if we don’t have much time. The Big Wood River can be accessed at multiple points in our community, so it’s a 5-minute drive to take Jasper down to the river for a hike. Driving a bit farther north gets us to Forest Service lands where we can take longer hikes and get some amazing views, or if we go south, we can check out the trails at Silver Creek, a world famous fly fishing area. Now that Jasper’s a bit older, we’re looking forward to some longer trips. Our goal this summer is to get him over to Stanley, Idaho, and the Sawtooth National Recreation Area. It’s full of alpine lakes and 10,000-foot peaks. I just got a backpack Jasper can ride in if he gets tired hiking, so I think it will extend our trips quite a bit. 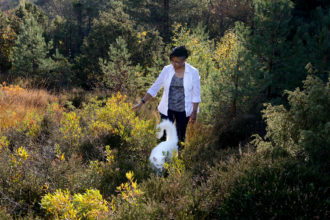 Can you tell us a little bit more about adventuring in different seasons? Does Jasper seem to have a favorite time of year? How does he handle the cold? Jasper’s favorite is probably spring and summer because he loves grazing on fresh grass and watching bugs and birds. Fall is probably my favorite just because it’s so beautiful here. This past winter was a 100-year winter for us for snowfall, so we kept our trips short and sweet, and in places where the snow was already packed down. Jasper doesn’t mind wearing a coat, so we would bundle him up and go. Even with that, though, he would shiver occasionally, so we’d make sure we stayed either close to home or the car so he could warm up. We tried to keep his outings limited to days where temps got above freezing just to be safe. On the opposite end, I also avoid taking him out in the summer when temps get too high. In summer, we’ll try to take him in the mornings before work, with longer outings on the weekend. 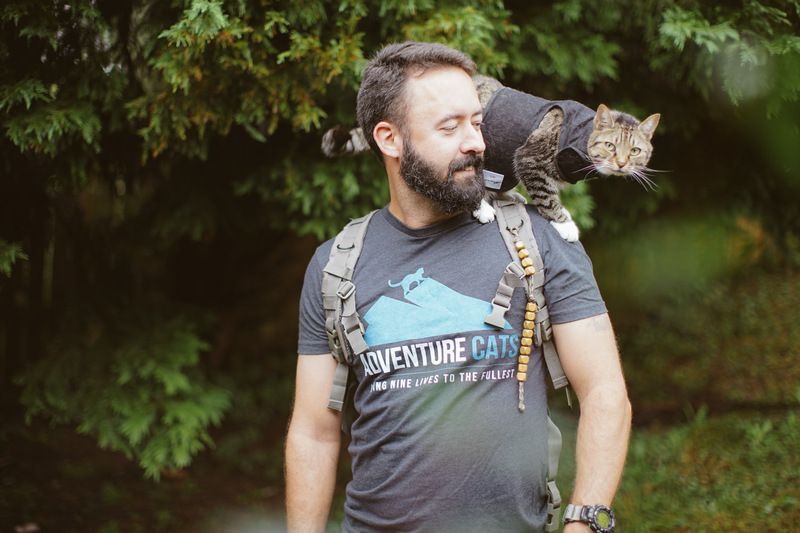 What are some of the challenges you’ve faced having an adventure cat? What would you say is the biggest reward? 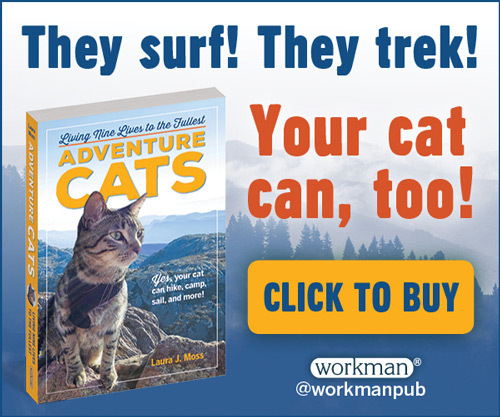 I think the biggest challenge is also what makes a good adventure cat — the high energy level! 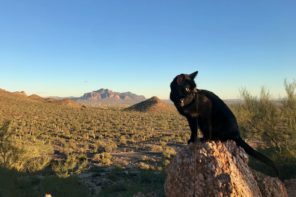 I don’t think any of my other cats would ever have been interested in taking hikes. I’ve almost had to switch my thinking about Jasper to consider him more like a dog than a cat. The other challenge for me is just getting over my nervousness about something happening to him. He does get startled sometimes by things like mountain bikes or strange dogs, and I worry if he had a chance to bolt he’d get lost. I’m definitely more nervous than he is, but as time has gone on, I’m feeling more comfortable that he’d stay near us. We also have to plan a bit more for him than we would for hiking our dogs. Do we need litter for the car ride? Do we have water and dish for him? Do we have wet food for him to help keep him hydrated? The biggest reward for me is just seeing the outdoors through his eyes. It’s so interesting — he fits in a really specific niche on the food chain as both predator and potential prey, and you can watch that play out. For example, there have been a couple of times when we’re hiking him along the river in the evening when a great horned owl has been intensely interested in Jasper, following us from tree to tree as we made our way back to the car. Jasper was definitely aware of it, and was looking for a way to walk under cover in the underbrush. The flip side is, he’s really interested in the occasional rabbit we see, and the vole holes under the sagebrush. The other thing I love is the double-takes we get from passersby. 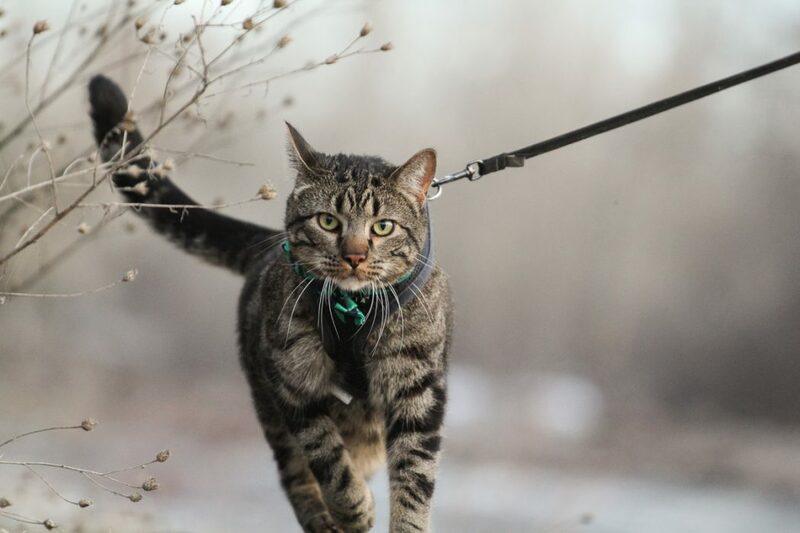 It’s so unexpected to see a cat hanging out in the car or on leash, and people love it. This is definitely a dog-loving town, but we’re trying to get some respect for the cats, too! 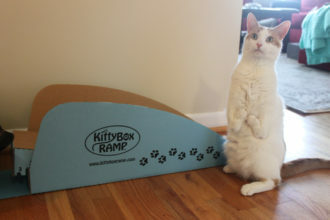 What advice do you have for people who are interested in leash training their cats? Get rid of your expectations and be patient. 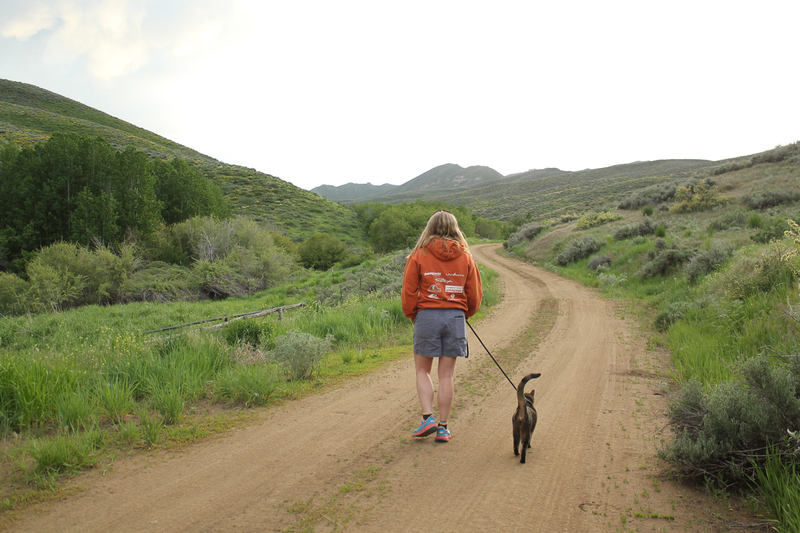 Having had active dogs for years, walking a cat was a completely different experience. Jasper takes things at his pace, and sometimes he just doesn’t want to go at all. We’ll get 20 yards from the trailhead and he will do a 180 and be heading back to the car. I don’t know if he smells or senses something he doesn’t like, but there’s no convincing him in the same way you could a dog. I figure it’s best to follow his lead at times like that and make sure he continues to have a positive experience. Scroll through the gallery at the top to see more photos of Jasper, and keep up with all his adventures on Instagram.